You might remember my blog post claiming we had a system with SDN-like properties more than 20 years ago. 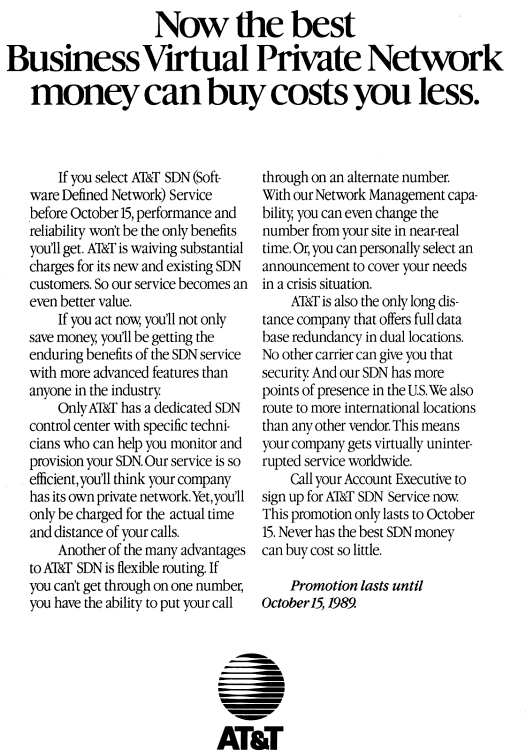 It turns out SDN is older than that – Rob Faulds found an old ComputerWorld ad from 1989 promoting AT&T SDN service, and it seems SDN was in operation as early as 1985. As history repeats itself maybe we can look forward to someone reinventing frame relay and a virtual gateway to connect to it so that our SDNs can connect circa 1995. Past is future! Yep I remember the AT&T, Lotus and Novell Server cloud solution offered back in 1994 etc. More like a rough IaaS or hosting soluting back then. With AT&T Frame-Relay network to your main and branch offices you can connect to AT&T hosted Novell servers that ran Lotus applications etc. Multi-tenant via DLCI and bare metal server per client. It didn't take off due to security and the protocols and pipes of that time were too fat. But again, nothing new. 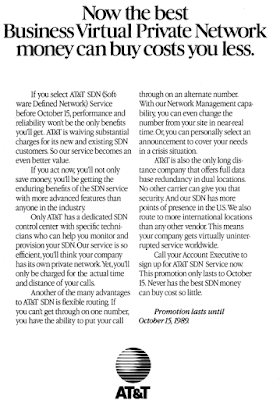 There's a Computer World article from 29th of April 1985 showing AT&T's "proposed Software Defined Network rates"